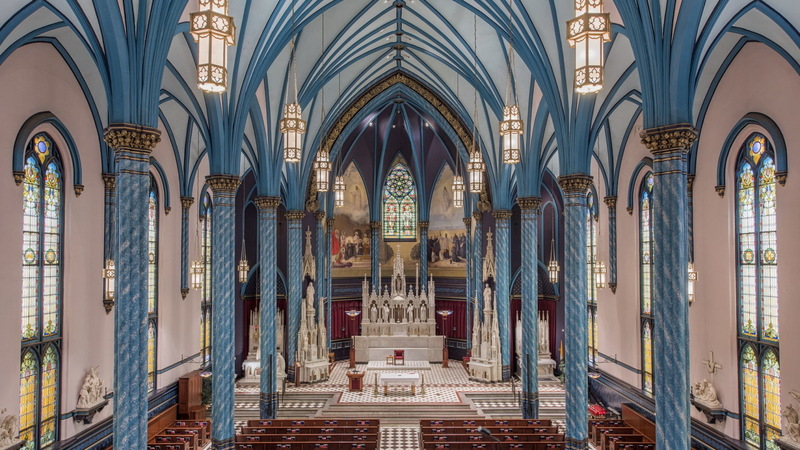 St. Francis Xavier Church is located at 611 Sycamore Street, Cincinnati, Ohio. The first Catholic Mass in Cincinnati was celebrated in 1811 in the house of Michael Scott. It was celebrated by Dominican Father Edward Fenwick, who would later become the first bishop of the new diocese. The house of Mr. Scott was on the west side of Walnut St. halfway between Third and Fourth. The first Catholic Church building was erected outside the city limits under the title of Saint Patrick in 1818 at the northwest corner of Liberty and Vine. The first Mass was said in this church (now Christ Church) on Easter Sunday, April 11, 1819. Two years later, Pope Pius VII formally erected Cincinnati into an episcopal diocese with Edward Fenwick O.P as the first bishop. Because of the difficulty of getting to the little church, now his cathedral, especially over the mud roads of winter, Bishop Fenwick purchased the Sycamore Street site and had the little cathedral put on rollers and moved to where our church now stands. Fenwick dedicated it to St Peter on December 17, 1826. Bishop Fenwick died in 1832 and was succeeded by Bishop John B. Purcell. Bishop Purcell bought additional property on Sycamore Street next to his cathedral and established a seminary and college there. Then, in 1840, he brought in the Jesuits to run the college and seminary. Meanwhile, he had begun to build a new cathedral at Eighth and Plum. When it was dedicated in 1845, the title of St. Peter-in-Chains was given to the new cathedral. The Jesuit church and college on Sycamore was then placed under the patronage of St. Francis Xavier. The seminary, retaining its name of “ Athenaeum of Ohio,” moved to Price Hill in 1848. The title of "parish" was returned to St. Francis Xavier when the cathedral relocated. The parish has been under the direction of the Society of Jesus (Jesuits) since 1840. The present brick edifice with sandstone facing and ornate clock tower was built in 1859. Although a horrific fire damaged this building in 1882, it has since been restored and renovated. Xavier University and St. Xavier High School were founded as a "college" next door to St. Xavier Church. Those two institutions have since moved to separate locations due to space constraints and expansion: XU in 1920 and X High in 1960. Today the parish church serves the downtown community with two daily Masses, six weekend Masses, daily confessions, and service outreach to those in the downtown area. A Video History of St Xavier College (The first 13 minutes show the history of our downtown properties).